← GRNC Alert 9-30-13: NCSBA and NCSBAC Presidents lie about attacks on state law! North Carolina Gov. Pat McCrory blasted back Monday at U.S. Attorney General Eric Holder, who filed a lawsuit on behalf of the Justice Department challenging North Carolina’s tough new elections law. The lawsuit, which was filed Monday afternoon, is the latest effort by the Obama administration to fight back against a U.S. Supreme Court decision that struck down the most powerful part of the landmark Voting Rights Act and freed Southern states from strict federal oversight of their elections. North Carolina’s new law, which was adopted last month, scales back the period for early voting and imposes stringent voter identification requirements. Nothing at all wrong with providing a valid ID for voting. Voting is serious and voter fraud is IMHO tantamount to treason as it subverts our political processes. If North Carolina can get rid of its State Income Tax that state will become very appealing! so I am most likely totally uninformed on all of this because I no longer vote. if voting actually mattered it would be illegal. anyhow… didnt we decide to issue drivers licenses to illegals not that long ago? 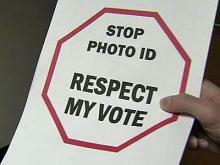 if so what the hell is the issue with them obtaining id to vote? seems like yet another frivolous waste of our money. it is amazing to me how much this country has changed. we bend over backwards for people who don follow the rules and kick the legal hard working guy in the balls.